The Washington Post reported online today (the article will run in the paper’s print edition tomorrow) that the literary and cultural landmark of the nation’s capital, Politics & Prose Bookstore and Coffeeshop, is for sale. 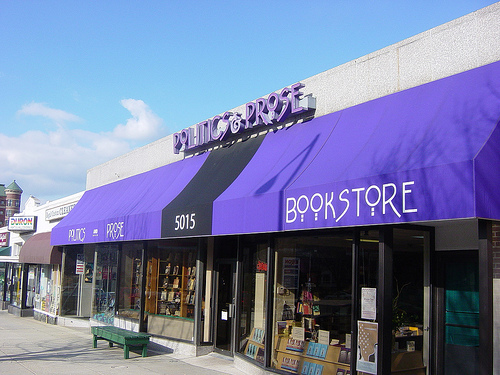 The bookstore, which opened in 1984 in the leafy, suburban-like Forest Hills neighborhood of Washington, DC, has operated continually for the past 26 years, expanding over time to a larger space that created room for a children’s department and coffee shop (which is run independent from the bookstore). Politics & Prose manages several unique programs, including a membership program that boasts members in forty-five states (including far flung states like Hawai’i) and, of course, the District; a book-a-month program; several public book groups; and an enormously popular events calendar of author readings, which include former appearances by President Bill Clinton, Man Book Prize-winning author Yann Martel, Nobel laureate Toni Morrison, and Pulitzer Prize winners Alice Walker, Richard Russo, and Junot Diaz, among others. An independent bookstore that has survived the birth and death of other independent and corporate bookstores in DC, the future of Politics & Prose reflects the uncertain future of brick and mortar bookstores everywhere. As folks reach for their iPads and Kindles instead of traditional books, the book publishing industry’s fears that books will go the way of music and movies by moving digital and online, usually for less or free, has expanded into a concern about the future of reading in general. Meade and Cohen expressly stated that whoever buys their bookstore should expect to continue their legacy which is closely tied to their role in the community of DC literati. 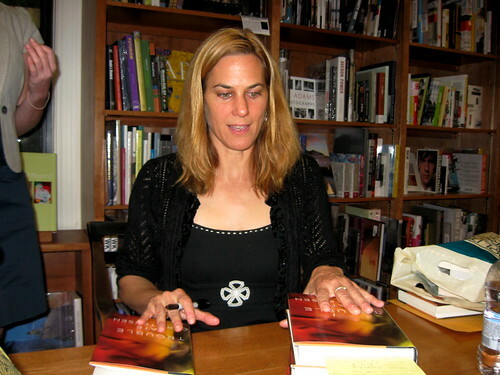 The winners represent selections based on votes by independent booksellers nationwide. Recently, a Los Angeles Times article mentioned that more adults are reading YA (young adult) novels than in previous years and sales of YA books are one of the few bright spots in a floundering publishing industry. Over at Flavorwire, the editors picked their selection of the ten best YA books for adults. Adults loving YA literature is nothing new, of course, as the number of adult Harry Potter fans shows. However, outside of massively successful children’s and YA literature that is deemed acceptable for older audiences despite its younger targets, literature for the young is often received with disdain by “serious” readers. Well, “serious” readers have no fun in life and probably spend their time drinking unsweetened tea and munching on rice cakes. The dividing line between adult and YA literature is a wavy, inconstant one and, despite the supposedly recent trend, not new. While there are plenty of trashy and terribly written young adult books, there are an equal if not larger number of trashy and terribly written adult books. However, just as The Catcher in the Rye is beloved by teenagers and adults alike, so The Curious Incident of the Dog in the Nighttime or The Book Thief can transcend the too often limiting label of “young adult” that prevents excellent books by fine writers from falling into adult hands. A smart bookstore will have YA books adults can enjoy and adult novels that adolescents can enjoy in both sections of their store. Further, a smart bookstore will have a well-read staff that isn’t limited by the demarcation lines of publishing house imprints. The same goes for smart libraries and librarians. Reading is for pleasure, not shame. Much of what prevents adult readers from seeking out and reading books otherwise categorized as “young adult” is the belief that if “it’s intended for someone younger than me, it must be beneath me.” Adult readers need to get over this limiting and fallacious belief because, not only is it silly, but it also shows a lack of sophistication about writing and books. This is one of the reasons why this actively encourages book reviews about YA books. We understand that, while not all YA literature is superb and not all of it will engage or interest adult readers, there are plenty of YA titles that adults can and should enjoy without feeling ashamed, idiotic, or a less serious reader. In this Issue #2, Rachel Heston Davis reviews Alison Croggon’s The Naming. In future issues, we look forward to bring our readers thoughtful reviews of adult and young adult literature. We feel it’s important to recognize writers outside of whatever publishing house imprints their books come from and without much regard to the average age of the target audience. Indie (independent) bookstores rock but the marketplace is hard for small stores trying to compete against the likes of Barnes and Noble and Amazon. What’s a future indie bookstore owner to do? The Globe & Mail talked with Jason Rovito recently about his soon-to-open Toronto bookstore named Of Swallows, Their Deeds, & the Winter Below. In addition to selling second-hand books, Rovito intends to sublet the space to other groups who share his vision and his quest to “…surround the books with related activities, things that can’t be translated into electronic exchange…” At the moment, that includes a literary journal and a school of writing. I’ve definitely experienced the thrill of commenting on a book someone was reading, excited that they were reading a book I loved. Only once has my comment been completely ignored. Most people smile kindly or state that they are/are not enjoying it, usually followed by a statement of how or why they came to read the book. (“My sister recommended it to me” or “I heard her speak on the radio” or “I absolutely loved his other books.”) We don’t become lifelong friends over a shared interest in the same book but, especially in urban areas where, more often than not, we don’t know our own neighbors, the momentary commonality is enough connection to add an extra skip in my walk for the day. Flatt goes on to describe ways reading books has crossed cultural and language boundaries, testifying in a very personal and very real way, how the love of reading and the love for particular texts provokes strong reactions in others, both good and bad. For my own part, people who comment on the books I’m reading often ask me where I purchased the title. Since I’m a fierce supporter of independent bookstores, I always direct them to the local indie shop (and, consequently, glare pointedly down at their Kindle if they’re holding one). What experiences have you had discovering connections through books?